Asian ginseng is a member of the Araliaceae family, which also includes the closely related American ginseng (Panax quinquefolius) and less similar Siberian ginseng (Eleutherococcus senticosus), also known as eleuthero. 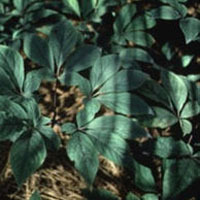 Asian ginseng commonly grows on mountain slopes and is usually harvested in the fall. The root is used, preferably from plants older than six years of age. Asian ginseng may improve libido and ability to maintain erection. Some early studies suggested there might be benefits of using Asian ginseng to improve athletic performance. One study reported increased pectoral and quadricep muscle strength in non-exercising men and women after supplementing with the herb. Asian ginseng has a long history of use in traditional herbal medicine for preventing and treating conditions related to the immune system. Supplementing with Asian ginseng has been shown to enhance feelings of well-being and improve quality of life in some studies. Asian ginseng is commonly used in traditional Chinese medicine to treat diabetes. A preliminary trial suggests that taking Panax ginseng may significantly improve a measure of cognitive function in the short term, though long-term use has not been established. Adaptogenic herbs such as Asian ginseng have an immunomodulating effect and help support the normal function of the body’s hormonal stress system. Adaptogens such as Asian ginseng are thought to help keep various body systems—including the immune system—functioning optimally. One study found that steamed then dried Asian ginseng had beneficial effects in people infected with HIV and increased the effectiveness of the anti-HIV drug AZT.